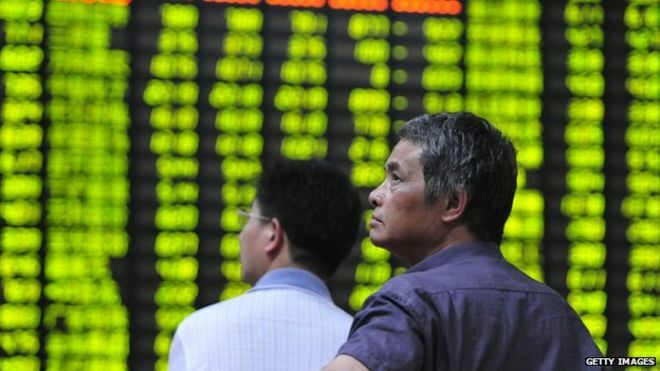 Mainland Chinese shares were trading erratically on Thursday as regulators continued trying to calm the markets. The Shanghai Composite index was up as much as 1.4% in mid-morning trade after falling 3.6% earlier. A move to ban big investors from selling stocks may have soothed investor worries, analysts said. Meanwhile, the state-run news agency Xinhua said police were investigating "vicious short-selling" on the country's stock market. Xinhua said authorities would "crack down" on operations that had broken the laws and regulations related to trading. By mid afternoon, the benchmark Shanghai index was up 1.3% at 3,552.8 points. China's market regulator has introduced a string of new rules in the past week to try and relieve pressure on Chinese shares - which have lost more than 30% of their value since mid-June. On Wednesday, the Shanghai Composite fell as much as 8.2%, leading some analysts to describe the session as 'Black Wednesday'. In the latest efforts to try and stem the falling markets, Beijing has relaxed lending rules - making it easier for people to borrow money for investment - in the hope that they will buy more stocks. That follows a move late on Wednesday to ban investors holding stakes of more than 5% in companies from selling shares in the next six months. Meanwhile, about 1,300 firms have halted trading in their stocks to prevent the value of their businesses falling further. The latest measure to be unveiled by the Chinese regulator is a ban on investors who hold more than 5% of any stock from selling it for six months. It is an extraordinary restriction, but coupled with all the other government-backed efforts to shore up prices in the face of China's massive slump, it may have finally brought some stability. That said, around half of all listed companies have voluntarily suspended trading, so it could be argued that the market is, in effect, as much seizing up as it is stabilising. Analysts are divided over the extent to which the dramatic unwinding of China's massive lending-fuelled stock market boom poses a threat to the wider economy. The volatility in China was mirrored in Hong Kong, with the benchmark Hang Sengindex reversing earlier losses - trading up 3.4% by mid-afternoon. 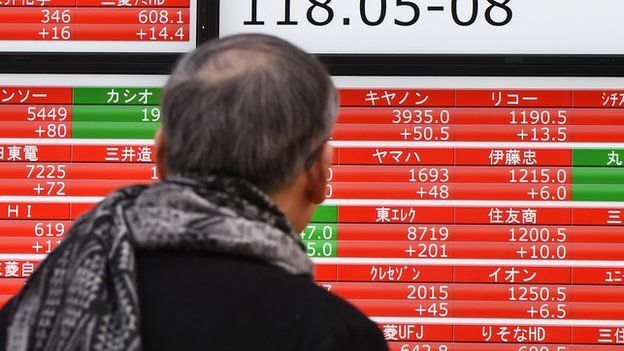 Japan's Nikkei 225 index was down 1.1% as investors worried about China's stock market and Greece's future in the eurozone. "Tokyo markets have been affected by Chinese shares since yesterday," said SBI Securities' Hideyuki Suzuki, who is general manager of the firm's investment market research arm. "But the Hang Seng Index and red chips which are now in positive territory are giving [a] sense of relief," he said. In Australia, the S&P/ASX 200 index was down 0.2% in afternoon trade. While South Korea's benchmark Kospi index slipped 0.2%.